For the sake of national pride, governments feel obligated to support sportspersons, especially in the hope of making a splash at the Olympics. But what makes companies and individuals spend money on athletes, when there are limited or no returns on the investment? Seven years ago, the fledgling Mittal Champions Trust (MCT) was presented with an opportunity to fund the training of a shooter named Abhinav Bindra. Bindra had taken part in the 10-m air rifle event the previous year at the Athens Olympic Games and come a cropper. Understandably, Manisha Malhotra, MCT's Chief Executive Officer, was reluctant to bet on him. She also thought that shooters, many of them from affluent families, were already better funded than other athletes. However, Bindra's teammate Gagan Narang persuaded Malhotra to change her mind and MCT began to back Bindra. Three years later, he became - literally - one in a billion by winning India's first gold medal in an individual Olympic event in Beijing. "He is a special athlete," says Malhotra, who played tennis for India at the Sydney Olympics in 2000. MCT, entirely funded by Lakshmi Mittal, who runs the world's largest steelmaker ArcelorMittal, has spent about Rs 3 crore so far on Bindra, and another Rs 32 crore on a bunch of other athletes of which 13 will give Bindra company in London. 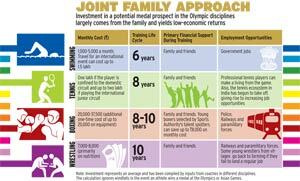 MCT, along with Olympic Gold Quest (OGQ) and GoSports Foundation, represents how far corporate patronage of athletes has come in India. None of the three exists to make profits. MCT and OGQ are run by former Olympians supported by a team of experts. All three depend on funding from companies and individuals, and operate within the parameters set by government-approved sports federations. Among the three of them, they would have at least 25 wards in the Indian contingent at the London Olympics starting this July. The number could go up as the qualifiers for some disciplines like women's boxing are still underway. "Sport has advanced so much. The difference between winning and losing is one per cent," says Viren Rasquinha, CEO of OGQ, a programme of the Foundation for Promotion of Sports and Games, the brainchild of former All England champion Prakash Padukone and former world billiards champion Geet Sethi. In his words, OGQ focuses on "everything at the backend, which bridges the gap between India's best and the world's best". Some of this bridging is done by giving athletes international exposure and the best of coaching, which these foundations, with their corporate mindset, are good at arranging. In theory, Rasquinha, his lean frame betraying his recent past as the captain of India's hockey team and his articulation a reminder of his more recent qualification as an MBA from the Hyderabad-based Indian School of Business, represents an ideal candidate to run an Olympic medal hunt. In practice, he symbolises structured thinking. OGQ and the other two foundations are convinced that the way to improve India's medal tally is through smart intervention. Both MCT and OGQ evaluate athletes against benchmarks set by their experts. Some athletes are gradually eased out of the programme if they do not measure up. 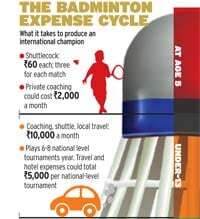 Smart intervention also shows up in hiring a coach from the UK for boxer Mangte Chungneijang Mary Kom and in giving 11-year-old Lakshya Sen global exposure. Sen, a badminton player whom Padukone has taken under his wings and describes as "exceptional talent", is being sent abroad to compete in tournaments. Waiting a few more years before exposing him to international competition would, says Padukone, only mean lost opportunities. Mary Kom, daughter of a subsistence farmer from Manipur, is India's top woman boxer and one of its brightest hopes for a medal in London. Some time ago, she realised that her body weight, at 46 kg, had to be increased. The organisers in London had done away with her usual weight category of 45-48 kg and she would have to compete in the 48-51 kg bracket. Now, ideally, a boxer's weight should nudge the upper limit of her category. But increasing the weight from 46 to 50 or 51 would affect body balance. So Kom needed expert coaching, which could only be sourced from overseas. OGQ, which supports Kom's training and preparation, identified Briton Charles Atkinson for her. "It was OGQ which helped arrange a foreign coach to come and train me," says Kom, though the bill is now being paid by the government. Here is an instance of a top medal prospect and a responsive government being complemented by a private foundation. "With elite athletes, you need right support at the right time," says Rasquinha of OGQ. The precision in OGQ's plans helped draw Vidya Shah's interest. Shah is the executive director and head of EdelGive Foundation, the philanthropy arm of financial services group Edelweiss. EdelGive supports three athletes picked by OGQ's talent spotters, of whom Mary Kom is one. "The evaluation process was robust," says Shah, a former investment banker with N.M. Rothschild, explaining why her foundation chose to go with OGQ. "Their method was transparent and documented." "It is just a feeling that India should win gold medals," says Mumbai-based Ashish Kacholia, a proprietary investor in equity markets, who has given OGQ Rs 11 lakh a year for each of the last four years. Regardless of how the equity market performs, Kacholia says he will continue the funding at the same rate for another four years. OGQ, over the last four years, has spent Rs 8 to Rs 10 crore on its programmes. GoSports, started in 2008 by Harvard-educated law practitioner Nandan Kamath, spends about Rs 75 lakh a year and concentrates on young athletes. In comparison, the sports ministry has spent about Rs 34 crore over the last year on just two disciplines, hockey and boxing, to prepare their practitioners for London (See Opex London, Pg 49). The ministry's annual budget is Rs 722 crore, which includes administrative costs and many programmes of talent spotting and training. None of the foundations plans to supplant what the government does; that is inconceivable. "No private organisation has the reach the government has," says Malhotra. It is smart spending at the margins that can make the difference, which is what the foundations do. Says Kancholia: "In India, a little money goes a long way." With time, there may be more than a little money in there. Compared to China, the size of the sports market in India - media rights, merchandising and other revenue sources - is relatively large. According to a PricewaterhouseCoopers study, 'Global Sports Outlook to 2015,' the size of the Indian sports market in 2012 will be $1.53 billion as compared to China's $2.7 billion, though China's economy is nearly four times bigger. According to Padukone, the effort and money spent in the last three years on preparing for London would be three times what was spent on Beijing. "India should get six to eight medals in London," he says. Anything less would not match the efforts. That sounds ambitious, considering the country's tally of seven individual medals so far, which began with K.D. Jadhav's wrestling bronze in 1952. But history matters little in such cases. China got its first Olympic medal long after India did, at Los Angeles in 1984, which was boycotted by the erstwhile USSR and its allies. Since then, China has managed 384 more, and topped the table at Beijing with a neat 100 medals. It is no surprise that China, which has taken forward the USSR's legacy of single-minded, state-sponsored pursuit of Olympic medals, is the envy of every Indian athlete and coach. Chinese government outfits identify talent at an early age and nurture it. This system, according to Rasquinha, ensures that "the base of the pyramid is very broad". A bigger pool increases the likelihood of producing first-rate athletes. For instance, China has about a dozen women who strike a badminton shuttle about as well as Saina Nehwal, India's best woman shuttler ever and one of the brightest medal prospects in London. In tournaments across the world, Nehwal finds herself battling Chinese women at key stages. All of them have come through a government-supported system and infrastructure. On the other hand, Nehwal's early years are a poignant story of her going to practice at 4 a.m. on her father's scooter and the family shifting base from Haryana to Hyderabad so the daughter could benefit from the badminton infrastructure there. Europe and the US provide the entire population with easy access to quality infrastructure. At later stages, as some athletes show the potential to turn professional, a market-driven system takes over. India is neither here nor there. Malhotra of MCT puts it bluntly: "The bottom line is that we need more athletes." For that more people should be able to access basic sports infrastructure. But, according to Padukone, Indian sports infrastructure has to increase 500 times to give everyone access. Not that the large population, comparable with China's, results in a large base of the pyramid like China's. The lack of a well-organised state-sponsored system puts paid to that dream. Bindra's path to gold at Beijing was charted entirely by him, his father's belief in him, and the little privileges enjoyed by the family. His 252-page autobiography, A Shot at History, released at the end of October 2011, elucidates the lengths to which he went to win that gold: from drinking Yak milk from China to increase concentration, which it did not, to adding rubber from Ferrari tyres to the soles of his shoes, to pre-dawn practice at the shooting range constructed in his backyard in Chandigarh and anytime use of the well-equipped home gym. The government could not have played a role in any of this, but its functionaries could have avoided sending Bindra a pair of shoes at Beijing in which the left was a size 11 and the right a size eight. A senior official of the National Rifle Association of India, when asked in March about Bindra's whereabouts, said vaguely that he might be somewhere in the UK. For a country with the fewest gold medals per capita, you would expect India's sports officials to be less detached with shooters. Other than the only gold, shooting got us a silver at Athens, by Rajyavardhan Singh Rathore in double trap shooting. The only other sport to have got us two Olympic medals is wrestling, where the situation is no better. Far away from the Bindra home in Chandigarh, on the margins of Roshanara Park in north Delhi, is an akhara, a training school for wrestlers, named after the late Guru Hanuman, a legendary coach in these circles. Inside the akhara, next to a mud pit, young wrestlers clad in loin cloth are doing pushups and sit-ups. A few are climbing a rope slung around the highest branch of a tree. Alongside young wrestlers, Rajiv Tomar is preparing for his qualifying bouts for London. Tomar, 30, who wrestles in the freestyle 120-kg category, has lived in the akhara the last 20 years. A young wrestler touches Tomar's feet before beginning his practice. Watching them closely is Maha Singh Rao, a coach employed by the Sports Authority of India (SAI). After the practice bout, the wrestlers wander away for a break. The younger ones among them begin crushing almonds and start preparing a meal. Rao shares a room with Tomar in the akhara, which houses 60 other wrestlers. Wrestling demands the discipline of a monastery. The boys begin living in akharas by age 11 and lead a monkish life for a decade or so as they train - with no television, no newspaper, no movies and no girlfriends. After that, once outside the protective canopy of the akhara, things become uncertain. Rao says the best wrestlers manage to land jobs in the Railways or paramilitary forces after about 10 years of training. The rest have no option but to drift away in search of livelihood, with no skill except the ability to pin an opponent down. But how does the akhara make ends meet? The question prompts salutary nods by Rao to a black-andwhite photo of Guru Hanuman with industrialist K. K. Birla, hanging on a wall with white limestone wash. Rao says the akhara has managed to keep body and soul together thanks to the generosity of Birla, whose empire spanned textiles, chemicals and newspapers. He says the akhara land is owned by a Birla textile company and to this day the company meets some of its running cost. The akhara is also affiliated to the SAI, which piggybacks on a longstanding tradition of private patronage. The Tata Group, for instance, has a history of nurturing sports. Tata Steel has a close association with football and archery. Some of the archers who have qualified for London are from the Tata Academy. According to the minutes of a meeting on archers at the sports ministry's website, "Tata" paid for international exposure to its archers. Tata Sons, the group's holding company, along with Tata Capital, the finance arm, funds Padukone's eponymous badminton academy in Bangalore. The coming together of Tata and Padukone symbolises the changing relationship that companies have with individual sports. Increasingly, it is less about the patronage of a shaukeen benefactor, as Rao describes Birla, and more about a focused strategy to get those medals.